Download Microsoft Windows 7 Upgrade Advisor 2.0 from Fileforum now. Here is the essential information you need to know if you're a Windows Vista user considering whether to upgrade to Windows 7: Yes. As folks have asked me outright, why buy it? Some have qualified this a little more delicately: Why do we have to buy it? Or as some have put it more pointedly, if Windows 7 truly is "Vista Service Pack 3," as I've observed before, then why didn't Microsoft actually release the product for free, maybe as Windows 6.1? You should invest in Windows 7 if you value your time. The minutes upon minutes you've spent waiting for Vista to do its thing -- to connect with the other Windows computer in your home network, to mount a removable device, to link to your handheld, to find your printer -- are actually hours, and they're worth money. If you were to place a reasonable dollar value on those hours, you'll find that the upgrade price is worth the investment. On average, I spend 54 hours per week as an online journalist, and maybe another six hours using the computer for entertainment. By my calculations, over the months I was running Vista on one of my production machines, at least four minutes per hour on average was spent unproductively waiting for Vista to do something -- to regain its Wi-Fi connection, to clear me as an administrator for some critical process, to refresh a directory listing, to reboot a crashed Internet Explorer, to cancel a search that became lost in a forest of meaninglessness, or to decide again that the monitor on my laptop was the only monitor on that laptop. Assume for the sake of argument that I didn't use any other computers in this office, that my Vista-based laptop was my main production system. I would reclaim four hours per week in lost latency time alone, just by moving to Windows 7. In the over two months I've been working with the RTM build, I have not encountered even once any of the issues I've just listed -- exercises in thumb-twiddling that characterized Vista as a product. 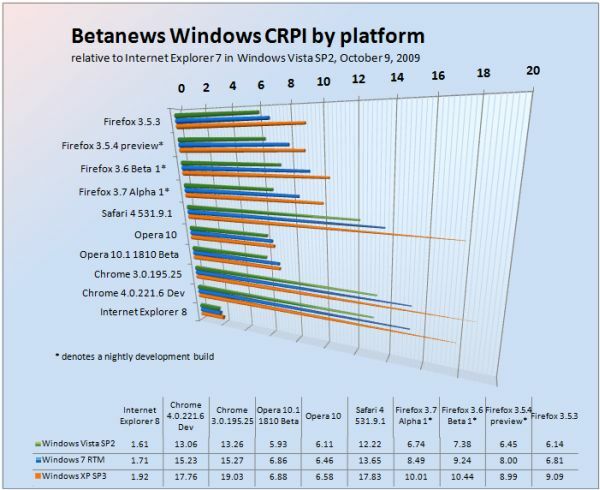 But the ability for you to reclaim your lost time does not end there: Betanews tests on all the major brands of stable and developmental Web browsers, running on the three most recent versions of Windows, installed on the same machine with the same hardware, show that programs tend to run 17% faster on average in Windows 7 RTM than in Windows Vista SP2. That doesn't make Win7 the fastest Windows ever made -- XP Service Pack 3 is faster still, by another 16% over Win7, at least at running Web browsers. But a slightly slower execution performance level is a fairer tradeoff than a significantly slower one, for an OS that presents the improved security that Vista actually did provide, the improved stability that Vista didn't quite provide, and the overall comfort level that Vista never even approached. Click here for a complete introduction to the Betanews Comprehensive Performance Index. Assume that any one of my computers runs on idle speed at least two-thirds of the time. That means for every hour of real-world usage, at least 20 minutes of that time is expedited by 17%. That's at least another three-and-a-half minutes per hour of work or online play gained back, which equates to another three-and-a-half hours per week recovered. Add that to the four I've reclaimed in thumb-twiddling time, and I've gained back some 385 hours of productivity per year. That's over six weeks of work. I can write a book in six weeks. After I told this to my wife, she suggested a new marketing slogan for Microsoft: "Buy Windows 7: Get Six Weeks of Your Life Back." Next: Do you need a new computer for Windows 7? [FULL SEC DISCLOSURE:] Microsoft supplies Betanews with evaluation software, including Windows 7, through its MSDN developer support program. 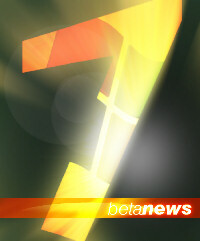 Microsoft also provides some technical expertise and insight to Betanews on request. In return, Betanews professionals participate in Microsoft testing programs, including with Windows 7, as well as other operating systems, tools, and applications. This relationship enables Betanews to thoroughly examine Microsoft software prior to its public availability. It does not contribute to, or color in any way, the opinions of Betanews or its writers. Scott M. Fulton, III is the author of this article, and as always, is solely responsible for his content. The opinions expressed here do not necessarily reflect those of Betanews or any of its other editors or contributors.